Birthmarks are coloured marks that are visible on the skin. They're often present at birth or develop soon afterwards. Vascular birthmarks often occur in the head and neck area, mainly on the face. But both types of birthmark can appear anywhere, including inside the body. If surface blood vessels are affected, a vascular birthmark will appear red, purple or pink. If the affected vessels are deep, the birthmark will appear blue. Salmon patches are flat red or pink patches that can appear on a baby's eyelids, neck or forehead at birth. 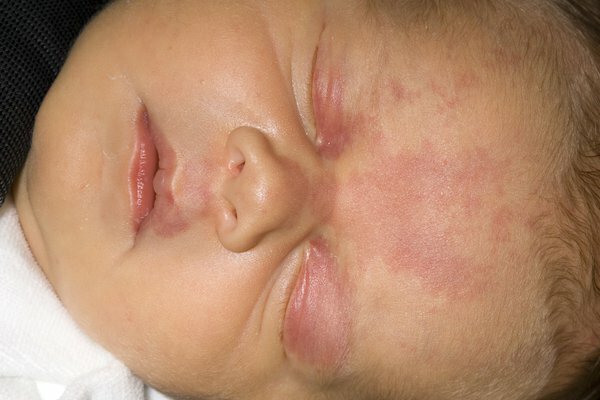 They're the most common type of vascular birthmark and occur in around half of all babies. Most salmon patches will fade completely within a few months, but if they occur on the forehead they may take up to four years to disappear. Patches on the back of the neck can last longer. Salmon patches are often more noticeable when a baby cries because they fill with blood and become darker. Infantile haemangiomas, also known as strawberry marks, are raised marks on the skin that are usually red. They can appear anywhere on the body. Sometimes infantile haemangiomas occur deeper in the skin, in which case the skin can look blue or purple. Haemangiomas are common, particularly in girls, and affect around 5% of babies soon after birth. They rapidly increase in size for the first six months before eventually shrinking and disappearing by around seven years of age. Haemangiomas that get bigger rapidly, or those that interfere with vision or feeding, may need to be treated. Capillary malformation, also known as port wine stains, are flat red or purple marks that affect a very small number of newborn babies. They can vary in size, from a few millimetres to several centimetres in diameter. Port wine stains often affect one side of the body and usually occur on the face, chest and back (although they can occur anywhere). They tend to be sensitive to hormones and may become more noticeable around puberty, pregnancy and the menopause. Most are permanent and may deepen in colour over time. Café-au-lait spots are coffee-coloured skin patches. Many children have one or two, but if more than six have developed by the time the child is five, you should see your GP. It could be a sign of neurofibromatosis (a number of genetic conditions that cause tumours to grow along the nerves). Mongolian spots are blue-grey or bruised-looking birthmarks that are present from birth. They're more commonly seen in darker-skinned people and usually occur over the lower back or buttocks. However, they can also appear elsewhere on the body or limbs. Mongolian spots may last for months or years, but they usually disappear by the time a child reaches four years of age. They're completely harmless and don't need treatment. They may sometimes be mistaken for a bruise. Congenital melanocytic naevi are also known as congenital moles. They're relatively large brown or black moles that are present from birth. They're fairly common and are caused by an overgrowth of pigment cells in the skin. Most congenital melanocytic naevi become proportionally smaller and less obvious with time, although they may darken during puberty or become bumpy or hairy. They can range in size from less than 1.5cm (about 0.6 inches) to more than 20cm (about 7.9 inches) in diameter. The risk of a naevi developing into skin cancer is low, but the risk increases the larger it is. It's not fully understood why birthmarks occur, but they're not usually inherited. Vascular birthmarks are caused by abnormal blood vessels in or under the skin, and pigmented birthmarks are caused by clusters of pigment cells. Port wine stains are thought to occur because the nerves that control the widening or narrowing of the capillaries (tiny blood vessels) don't function properly, or there aren't enough of them. This means that blood is constantly supplied to the skin in that area, which makes it permanently red or purple in colour. Port wine stains are sometimes related to other conditions, such as Sturge-Weber syndrome and Klippel-Trenaunay syndrome. Most birthmarks are harmless and don't need to be treated. Some types of birthmarks will fade over time, whereas other types such as port wine stains will be permanent if they're not treated. In some cases, a birthmark will need to be treated for medical reasons – for example, if a haemangioma blocks the airways, affects vision or becomes ulcerated. Some people may also decide to seek treatment for cosmetic reasons.